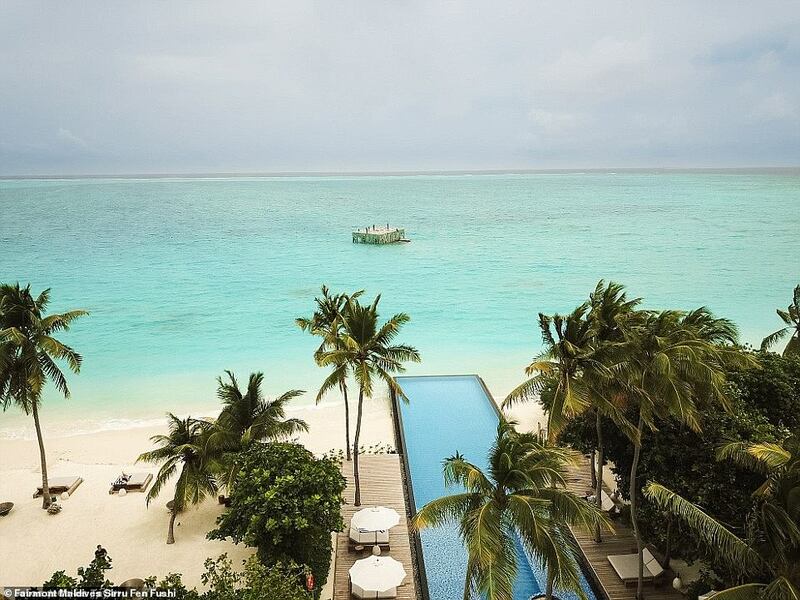 Police armed with pickaxes and power tools have destroyed the world's first tidal gallery at a holiday resort in the Maldives after it was deemed 'offensive to Islam'. 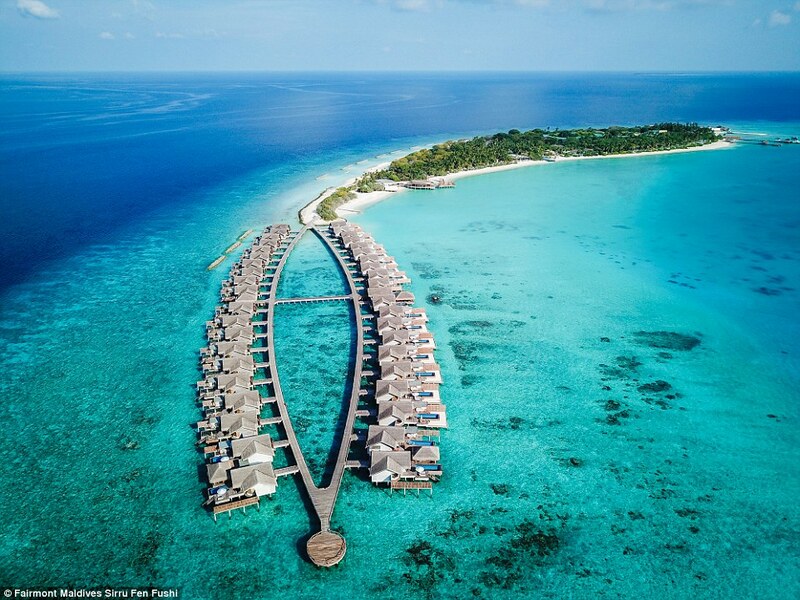 The gallery, at the Fairmont Maldives Sirru Fen Fushi, which opened in July, featured semi-submerged exhibits that disappeared and reappeared as the tide went in and out. But Abdulla Yameen, the outgoing president of the tourist nation, home to 340,000 Sunni Muslims, ordered the sculptures to be demolished. Islam, the official religion in the Maldives, bans the depiction of idols, and the work provoked some criticism from clerics even though the statues have no religious symbols or meaning. Yameen made the order in July, but his ruling was not acted upon until last Friday, the eve of a presidential election, which he lost to a liberal candidate. 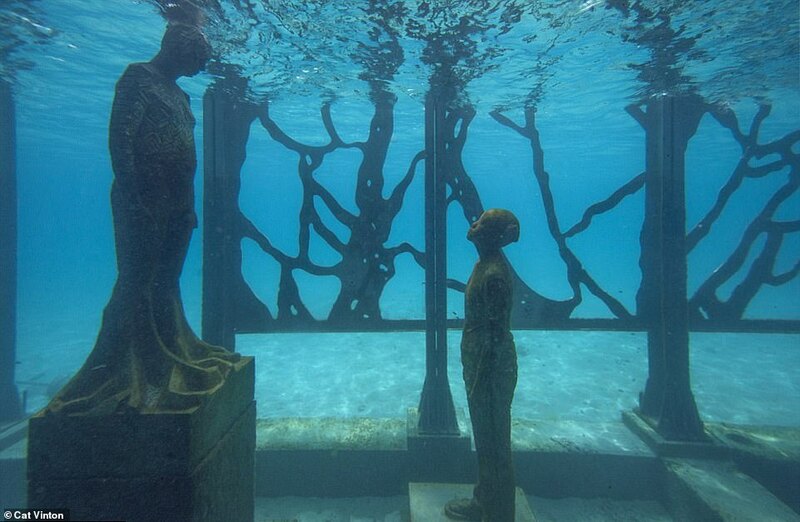 The artwork, known as the Coralarium, was designed by British artist Jason deCaires Taylor. 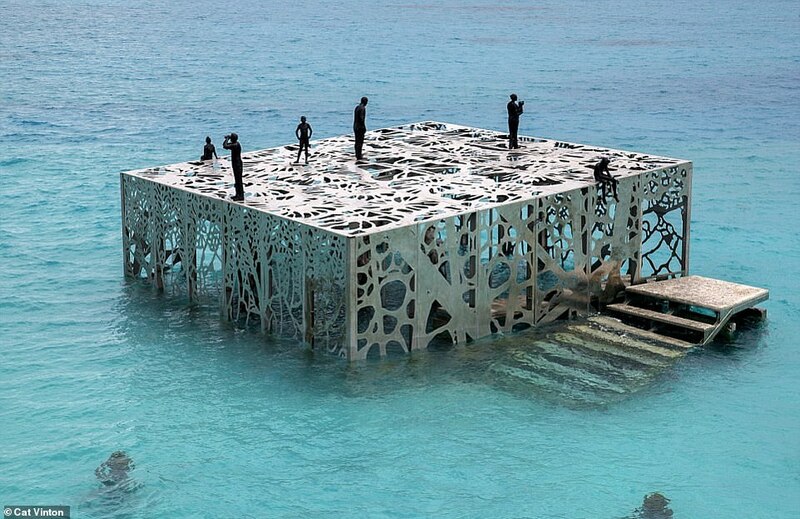 Resort guests could swim from the shore to the an underwater realm of human-shaped figuresIt was claimed the gallery structure would act as a sheltered space that offers a permanent sanctuary for ocean life such as fish, crustaceans, octopuses and marine invertebrates. While in the evening, an integrated light system illuminated the gallery and attracted marine life while creating an impressive sight from the island shore. British artist Jason deCaires Taylor describes himself as a sculptor, environmentalist and professional underwater photographer. He studied sculpture at the London Institute of Arts and has since created artwork that has been displayed all over the world. Mr deCaires Taylor is best-known for creating semi-submerged sculptures that are revealed and hidden again depending upon the tides. 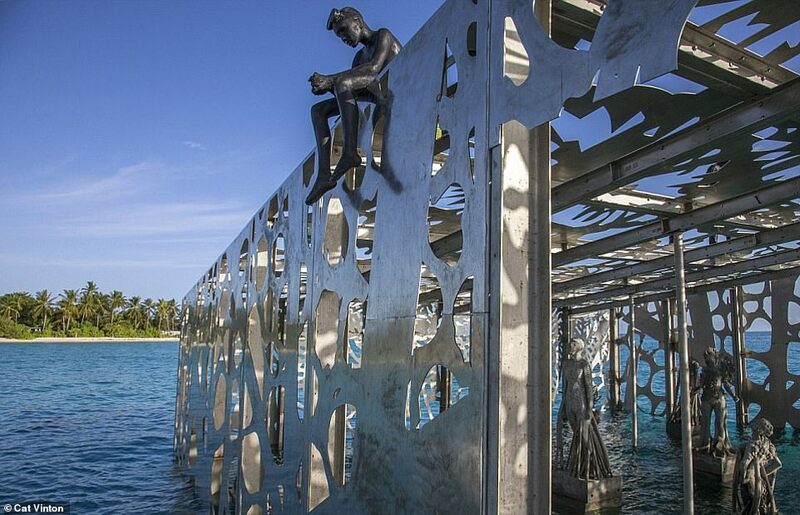 He designed the first underwater sculpture park off the coast of Grenada in the Caribbean, which has been listed among the Top 25 Wonders of the World by National Geographic. 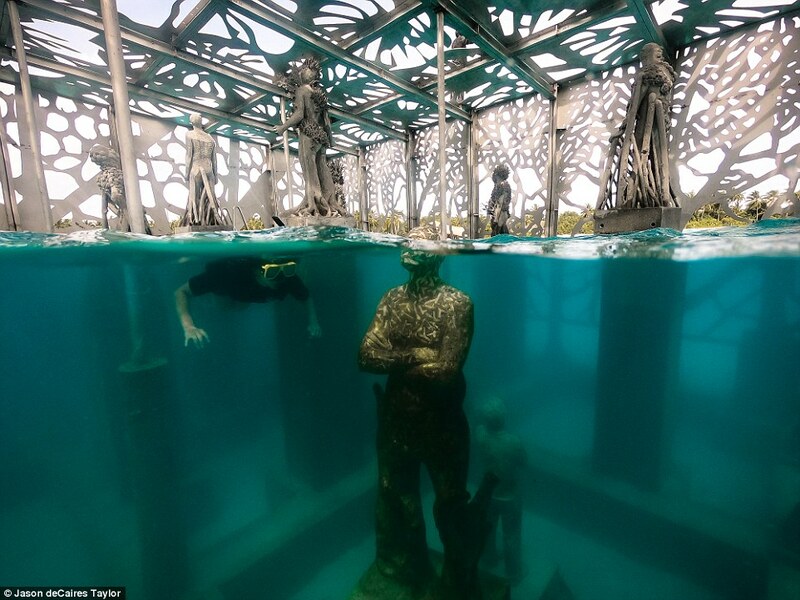 His biggest project to date is the Cancun Underwater Museum in Mexico. Each of the 460 statues in the underwater exhibition are made from PH-neutral marine concrete designed to encourage marine plants to grow and attract fish to the region, and the museum was set up to draw tourists away from nearby coral reefs. His other major works include a collection of 300 submerged sculptures in Lanzarote, the first of its kind in Europe. He also created The Rising Tide series of horse sculptures, which are semi-submerged in London's River Thames close to the MI6 secret service headquarters, and 'Ocean Atlas' the largest ever underwater sculpture off the Bahamas. However, Yameen said in July that 'significant public sentiment' against the artwork known as 'Coralarium' had guided his decision to destroy it. 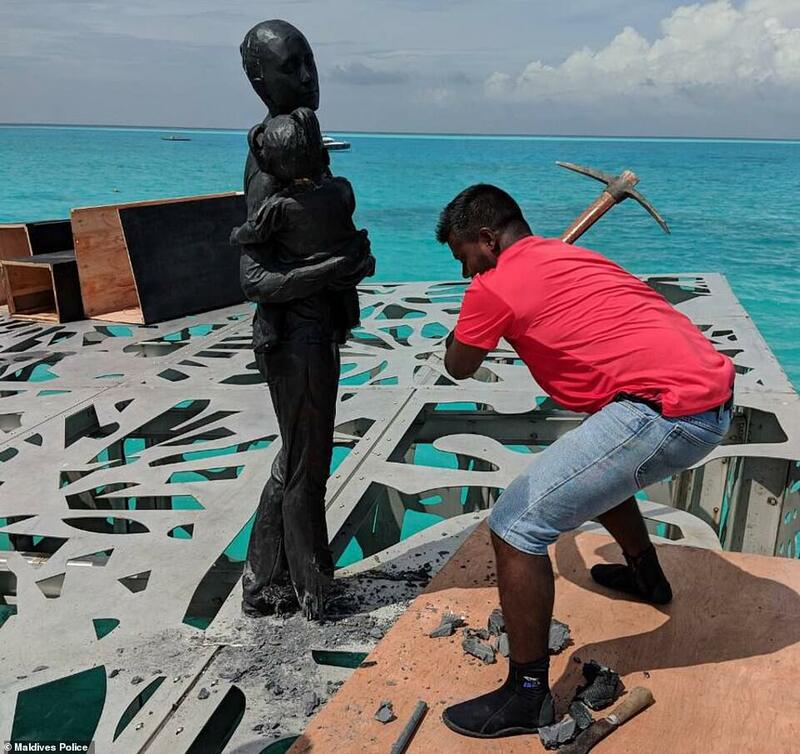 It is unclear why the sculptures were not raised from the waters until Friday, just two days before Yameen was turfed out of office. Police were photographed chipping away at the works with pickaxes and using power tools to remove them from the large and ornate cage housing them. A video posted by state media showed several men tearing a statue off a plinth. Artist Mr deCaires Taylor told AFP in a statement: 'I was extremely shocked and heartbroken to learn that my sculptures have been destroyed by the Maldivian authorities at the Coralarium, despite continued consultations and dialogue. 'The Coralarium was conceived to connect humans to the environment and a nurturing space for marine life to thrive. Nothing else! 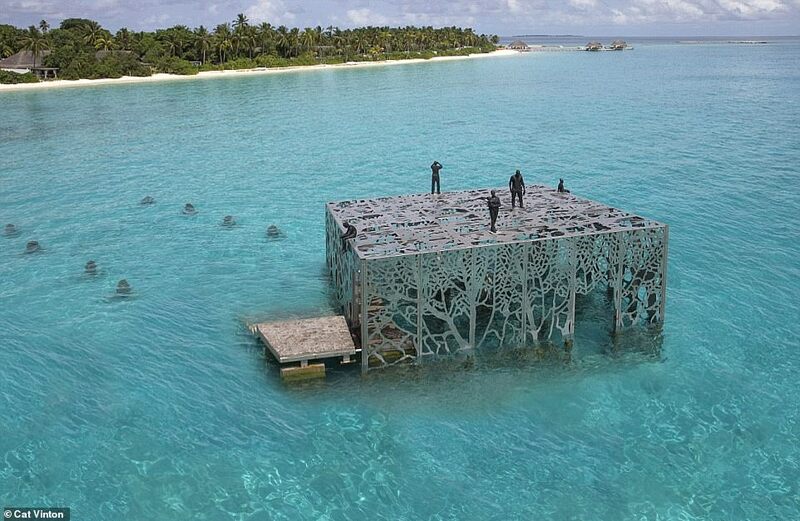 A spokesperson from the Fairmont Maldives said: 'While we are very surprised by the sudden removal of eco-art pieces by the authorities we respect the people, traditions and customs of the Maldives. 'The removal process of the installed artwork was peaceful and friendly without interruption to our world famous service. 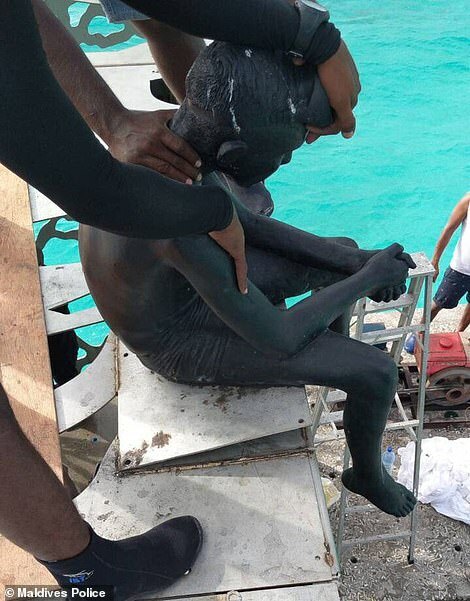 The import of statues is prohibited in the Maldives. Even depictions of the Buddha are banned despite a long legacy of Buddhism on the islands before Islam came to dominate the archipelago. Despite the edict, huge cutouts of Yameen towered over the capital Male in the lead-up to Sunday's poll, which he lost after five years of strongman rule marked by a regression from democracy. Many of these cardboard posters depicting the ousted leader were torn down after he suffered a shock defeat to opposition candidate Ibrahim Mohamed Solih, an act of defiance unthinkable under his iron-fisted leadership. Sunday's election was held with all key opposition leaders behind bars or in exile, leaving the little-known Ibrahim Mohamed Solih to challenge Yameen. In a major upset, Solih won with 58 percent of the vote. Solih's victory was greeted warmly by India as Yameen had drifted closer to China, borrowing heavily from New Delhi's regional rival to invest in infrastructure. Declaring victory, Solih demanded Yameen immediately release all political prisoners in the country. A Maldivian court freed five of them on Monday night. Many more are still in jail, including Yameen's estranged half-brother and former president Maumoon Abdul Gayoom, 80, who is expected to be released shortly. Under intense international pressure, Yameen conceded defeat and pledged to allow a peaceful transition when he formally steps down on November 17. Yet another example of the utter backwardness of the Islamic mind. What next? Destroy the Pyramids? After all, they predate Islam by thousands of years. This relative newcomer fake religion cannot possibly tolerate any reminder that the world did just fine before these A-holes stumbled out of the great cat box where God put them (for good reason). That is without doubt the stupidest comment of the week. The banning of images comes from the ten commandments "You shall not make for yourself an idol of any kind, or an image of anything in the heavens above, the earth below, or the waters under the earth.'. The fact that Judaism and Christianity do not follow the strictures of their religions (e.g. Usury) and ignores the laws of their holy books does not mean that all religions should do so. What an ignorant fool you are, and yet you denigrate others. Peter, Jizzmo's post may be slightly offensive, but it still makes more sense than yours. The images produced by the artists were not offensive to intelligent people. No, they were offensive to religious people who wish to follow the commandments of their God. The fact that you cannot make sense of this, says more about you than them. Subzero IQs strike again. You also gotta be crazy to live there, considering how far above sea level they are. A local tsunami could wipe the place, though after reading this I wonder it that would be a bad thing. Ayuh, for the plants and critters, but. . .
Top three among the world's shortest lists is all the everyday Western customs and traditions which aren't offensive to Islam..